Back in December I wrote that I was starting a three months course of Seven Seas Perfect 7 Woman, a daily vitamin and mineral supplement formulated to help you fight the first signs of ageing from the inside. I've been taking these for a month and a half now so thought I'd give you an update. Firstly if you haven't read my original post then you can find that just HERE which explains more in-depth how these tablets work and the areas in which they help. 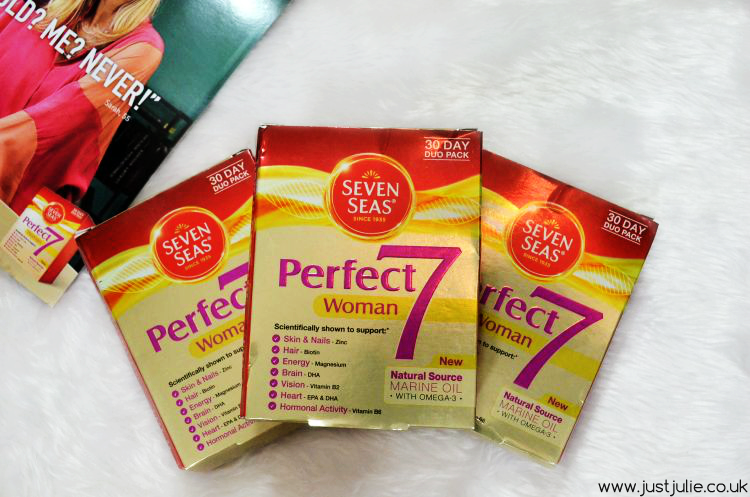 Seven Seas Perfect 7 Woman isn't just aimed at those who want to fight the first signs of ageing. Seven Seas have been researching marine oils for over 70 years and have found that this is key to helping you keep a healthy heart and brain function. Add in Omega-3, Zinc, Biotin, Magnesium and a number of vitamins the unique formula will help target other areas that most women are concerned with, like tiredness and fatigue, hair, nail growth and strengthening, balancing of hormones and vision. Seven Seas Perfect 7 Women comes in the shape of two tablets, one a vitamin tablet and one a fish oil tablet, these are packaged up in different coloured blister cards (silver and purple) and are to be taken morning and night. They're a little hard to swallow at first but after a few days I was necking them back with no problems! Now I'll be honest up until I started this trial I had never taken a vitamin in my life. It's something I kept telling myself that I should, but I just never did, but now I'm 33 I have noticed changes within myself, and it's not just what's on the surface. I suffer with insomnia, I feel so lethargic on a daily basis, my hair doesn't ever want to grow and my monthly cycle is just horrendous (it always has been) So although I'm concerned with the ageing process and obsess over any fine line that appears on my face, for me the other areas are an issue that I deal with most days, that have an impact on my life, which is why I was so excited and keen to be asked to trial the Seven Seas Perfect 7 Woman out. Obviously I will hopefully notice more of a change by the end of the trial, but I really wanted to give an update as I'm half way through and I'm honestly shocked at the changes I've already seen! Tiredness and Fatigue: As I said I suffer with insomnia which in it self is frustrating but my daily life is impacted by lack of sleep. Three weeks into my trial I noticed that I was sleeping much better, not waking up during the night so often, actually waking up and feeling refreshed and alive. During the afternoon where I'd have little energy, things have improved and I'm definitely feeling a lot more energised for the duration of the day. This for me was the moment that I knew that something had changed within me and I'm confident that with continued use of the tablets this will further improve. Hair and Nails: I've always been honest that I have damaged my hair over the years, although my hair has improved massively over the past two years due to using better quality hair products and using less heat in a responsible way, there is still a long way to go, and of course, working for ghd means that I can never go heat-less on my hair (I'd never want to anyway) For me the issue is now about helping my hair to grow. I visited my hairdresser recently and she commented on how my hair felt stronger, thicker and that it had grown quicker than what it normally does when I see her. For a professional hairdresser to notice this change means that something is working and that would be the biotin! As for nails, well I wear acrylics so I couldn't possibly sit here and tell you there has been a change as I never see my own nails! Hormone Activity: Not only do I suffer with a heavy period flow, that can last up to 7 days, I also normally suffer with extreme pain to the point where I can barely stand, I also can get very hormonal, I'm either a hormonal wreck or I'm a quivering baby, there's no in-between. I've just finished my second monthly cycle since taking these tablets and I have to say my last period was much easier to deal with. I was still heavy, it still lasted 7 days but the pain was a lot less and I don't think I actually bite anyone's head off this month, there were no tears either. So this is an area that I think I can only truly judge after taking these for a longer duration, however I'm pleased that the pain has become slightly less and that my hormones appear to be balancing out. Skin: My poor skin is currently trialling out too many skincare products than it actually should, but you know what my skin is actually looking a lot less dull and tired (could be an knock on effect from sleeping better) it's also feeling a lot more hydrated too, which is a big area of concern for me. For me this is another area that would need to be revisited several months down the line, but it's feeling and looking better so again I'm hopeful on this one too. The other areas that Seven Seas Perfect 7 Women works on include Heart Function, Brain Function and Vision. These aren't areas that I myself currently have any issues with, so I don't have any reports on improvements. I have to be honest, I was a little sceptical as to whether I'd notice any changes and the big ones for me are the four that I've elaborated on and I'm honestly shocked that I have noticed changes, some more than others, but not everything improves at the same rate. I'm extremely pleased with how these have actually worked. I'm looking forward to seeing if there is any more changes during the remainder of my trial, but half way in I'm already sold and will be continuing to take these after the trial has ended.